I think Shakespeare might have been seeing into the future of BottleRock when he said “parting is such sweet sorrow.” True story: on the last day of the inaugural festival in 2013, I remember thinking that I was like a kid at summer camp; I wanted to just keep coming back, but I knew that if I showed up the next day, all my friends would be gone and it would just be a big, sad mess that would leave me emotionally scarred. Thankfully, though, after an amazing Day One and a lovely Day Two, I still had a whole final day to see, and this time, my bestie had come to join the fun. Echosmith’s Sydney Sierota sings in the breeze. 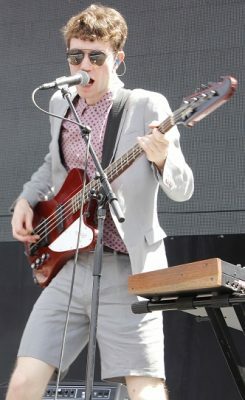 Big brother Noah Sierota on bass. After Echosmith, we opted to make the wine/cocktail rounds while American Authors took to the stage for a pretty great set. Their cover of Florida Georgia Line’s “Cruise” was a little highlight for bestie’s 11-year-old daughter, who we called so she could hear it. Of course, their biggest hit to date, “Best Day of My Life” was appropriate for a wonderful day like this, so it was our favorite part of the set as we hung way back in the crowd sipping on Ca’Momi bubbles and Brett Dennen’s Charismatic Fool Sparkling Rose (more on him later, though). 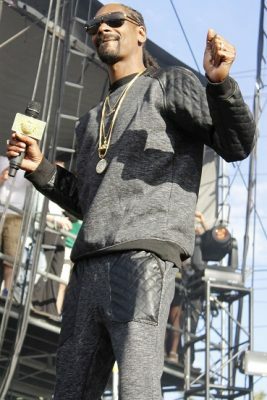 Next it was time to cross another huge artist of my bucket list, so we got as close to the main stage as we could in time for the appearance of the one and only Snoop Dogg, who was one of the best parts of the entire weekend. For me, this dude epitomizes “swagger,” and I couldn’t take my eyes off him. More to the point, his unmistakable voice is irresistible live, and he gave the crowd everything they wanted and then some. My only criticism isn’t really one, and is minor anyway: don’t you guys think the poor guy was probably roasting in that sweat suit? Anyway, if he was comfortable, I certainly was… he rocked my world, and I loved him for it. 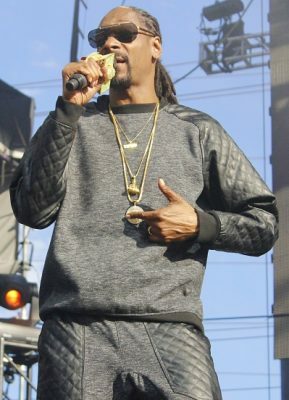 Real talk: Snoop Dogg was one of the highlights of the whole weekend. 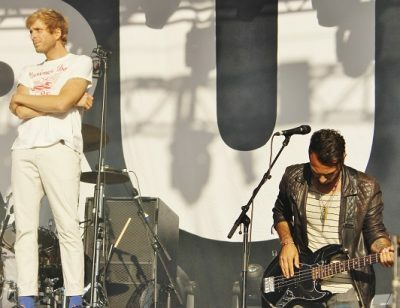 As the day began to wind into late afternoon/early evening, we headed over to the (other) main stage for AWOLNATION. I really wanted to hear them play “Sail,” and the bonus on many festivals is that artists won’t wait till the very end of their sets to play huge hits because they know you’re trying to cram as many acts into your day as you can. 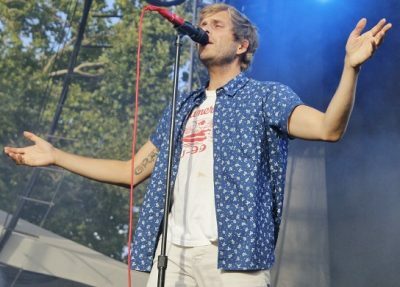 Sadly, this was not the case with AWOLNATION, and so they closed with “Sail,” meaning I didn’t get to experience it live, but what I will say for the part of their set that I did get to see is this: I love their distorted, grungy, electronic rock sound, and frontman Aaron Bruno’s energy. I had a hard time taking my eyes off him, and with the handsome Drew Stewart so near, that’s really saying something. 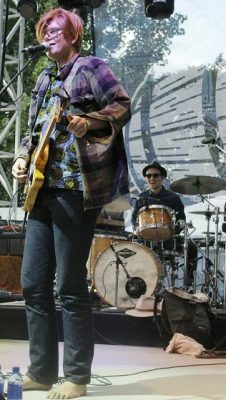 I can’t wait to see them again and finally get to hear “Sail” (and an entire set!) in all its glory. Bruno surveys the crowd while Drew Stewart jams. 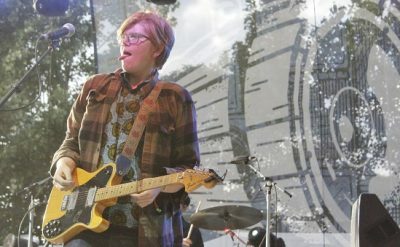 Brett Dennen – barefoot and beautiful. After a very brief break, they were back for a quick two-song encore, consisting of “Push and Shove” and “Spiderwebs,” which ranked just about as high as “Just a Girl” in terms of equal parts reminiscence and contagious energy. 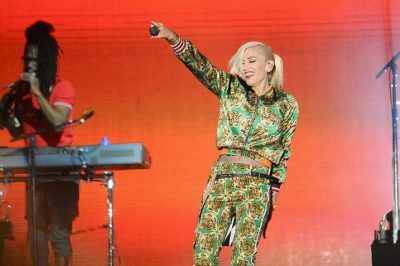 No Doubt did not disappoint; they were the perfect end to yet another fantastic BottleRock Napa Valley festival. I already can’t wait for next year – who’s with me?